B. Thomas (Arlington, Texas, United States) on 31 May 2011 in Animal & Insect. 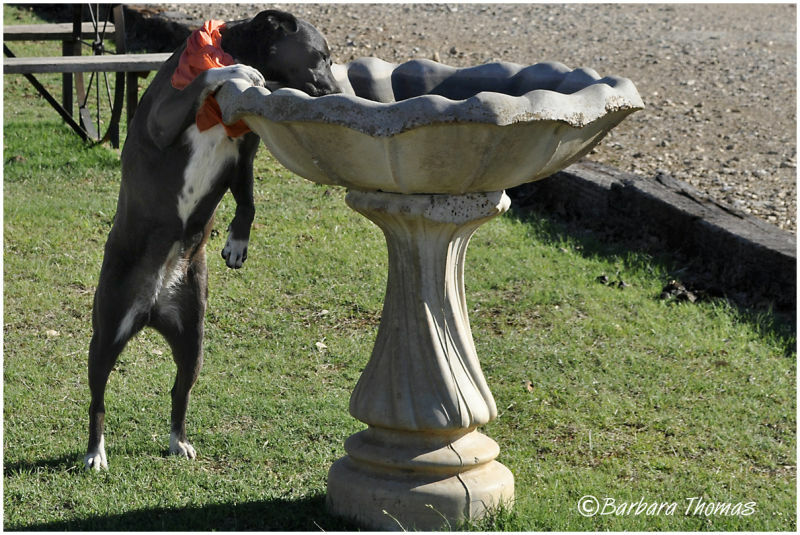 Boots the ranch dog wearing her finest scarf, checks out the bird bath for a drink. **I'm posting a series of photos from an April trip to Fredericksburg, TX in Hill Country. Great picture for silly tuesday. Now that is a good-looking and smart girl! Nice stretch. I guess the water always tastes better in the other guys bowl. Fancy water dish, I'd say, fit for a princess. Ha - too funny! She certainly knows where to find the water! Great capture, I like this dog's attitude! How funny to see her standing up there for a drink of water. Thanks for you explanation about your photos re: the portfolio. I put each of mine in so I can look back to see what I've used, etc.